The quite village of La Preneus is located just few km towards the south of Tamarin. La Preneuse beach and the surrounding area of Rivière Noire is a wonderful location for relaxation. The beach itself is not the popular tourist destination and is therefore quite and less crowded than the other beaches of the north. The wide lagoon of white sand is bordered by a soft swathe of grass and trees which offers the perfect spot for picnic with your family. You can also enjoy snorkeling at the beach. The Mauritius Marin Conservation is located La Preneus and is also planning to open Marine National Park here. In 1978, a naval battle took place on the mouth of River Noire, opposing the French, who at that time occupied the island. Pursued by two British vessels, French captain, Jean Marthe l’Hermitte, with his two ships, Preneuse and La Brule Gueule entered the place and installed two cannons at the entrance of the pass. Following a short battle, he forced the British to retreat. In honor of the victory, the bay was named as La Preneuse. At La Preneuse, the British constructed Martello Tower in 1830 to watch the “enemies” ships to approach along the coasts. They used this as a shelter place in case of any attack. Since the 5th century, many similar towers were built at strategic points around the island to protect theIsland from pirates. Few of the towers have disappeared or ruined but one of the tower, the Martello Tower is very well maintained and currently serves as a museum where its history is depicted in detail. This small west coast beach of La Preneuse offers unrivaled views of the sunsets in the Indian Ocean. The beach is ideal for swimming lovers and deep-sea fishing lovers. You can also go for a big gaming fishing trip here. You can take a full day or half day excursion to discover the south-west region of Mauritius, adventure tour to the Black River Georges National Park or visit the Casela Nature & Leisure Park. 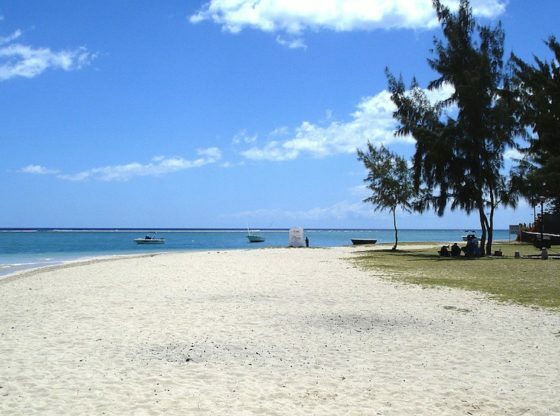 You can enjoy relaxed & peaceful day along the beach of La Preneuse with your friends or family where you can enjoy barbecue with soft Mauritian music as the musicians beautifully play the typical Mauritian music one after another. There are a variety of small hotels and guest houses to choose from in locations that are only a few minutes’ walk from the beach. “Bilimbis” is a very charming villa on the beach of la Preneuse with all required facilities. La Mariposa is also a good option on the beack with 14 studios and 2 apartments equipped with garden and swimming pool. La Preneuse provides some friendly places to eat like Le Bonne Chute Restaurant which is a garden restaurant and serves delicious food.